Is Nashville's director of schools trying to find a scapegoat to blame for his district's own shortcomings? 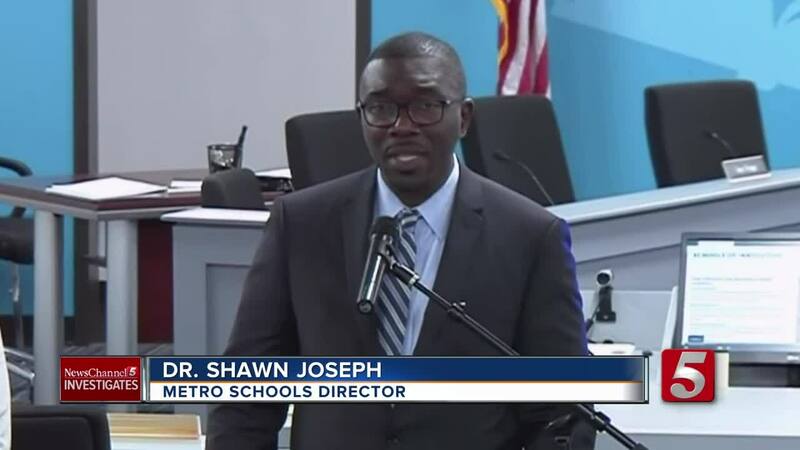 Now, NewsChannel 5 Investigates has uncovered serious new questions about the story that Dr. Shawn Joseph has told about why Metro Schools failed to report teacher misconduct. Joseph faces a possible reprimand from the State Board of Education for failing to report teachers who have been fired or suspended for misconduct involving students. The incident that began the investigation involved former Overton High School Coach Arnett Bodenhamer. After an explosive outburst last year that was caught on video, the principal recommended that Bodenhamer be fired -- not only for getting physical with the student, but also for calling the student's mother in what she described as an effort to cover it up. Joseph decided to give Bodenhamer a five-day suspension, instead. Under state law, the teacher's suspension should been reported to the State Board of Education so it could conduct its own review of his teaching license. "This is a matter of student safety," said Nathan James, director of legislative and external affairs for the Board. "It is a matter of protecting the reputation and the integrity of the teaching profession." After seeing NewsChannel 5's initial report, State Board of Education staff began an investigation. It has since discovered that even more teacher misconduct cases went unreported, potentially breaking state law. Joseph's response: blame someone else. "We did have a situation where an employee who is no longer an employee in the district that did not send those reports," Joseph said during a recent news conference. Last week, as the Metro School Board demanded answers, Joseph's human resources chief, Deborah Story, echoed that defense. "I can say that a former employee did not submit reports on a consistent basis," Story told school board members. But NewsChannel 5 Investigates discovered that, in the case of Arnett Bodenhamer, that former employee -- Scott Lindsey -- did exactly what he was supposed to do. We obtained a "director's report" regarding Bodenhamer's suspension that was prepared by Lindsey. An email shows Lindsey sent it to the director's assistant, "per [their lawyer's] instruction for Dr. Joseph's signature." The records show that Joseph signed the report and his assistant sent a copy back to Lindsey with a note, saying it had not yet been sent to the state. But the assistant did not ask Lindsey to send it. Joseph's team told the school board last week that it's the HR department's job to prepare the form, but it's not their job to submit it. Board member Jill Speering asked, "So Dr. Joseph's office is responsible for sending that to the State Board, is that correct?" Mary Ellen Zander, the district's director of employee relations, replied: "Yes." Story also suggested to the school board that the director has no way to know about suspensions where state reports would be needed, for example, if the human resources department does not tell him. However, under state law, the director must personally approve and sign all letters suspending or terminating teachers. "The captain of the ship is always responsible for what takes place on the ship," said the State Board's Nathan James. "The superintendent of schools is responsible for what takes place in the district." It turns out that the man the district has tried to blame is a key witness in two separate lawsuits over how Joseph's team has handled sexual harassment cases. Lindsey tried to put former John F. Kennedy Middle School principal Sam Braden on administrative leave after allegations were made. One of Joseph's HR bosses intervened to stop him. In the case of former administrator Mo Carrasco, Lindsey uncovered evidence that led to the resignation of Joseph's longtime friend. According to the lawsuits, that resulted in Joseph's team retaliating against Lindsey. "In fact, he got it right," said attorney Gary Blackburn, who filed one of the recent lawsuits. "He found that Mr. Carassco was guilty, and the retaliation began immediately -- write ups, petty harassment." And NewsChannel 5 Investigates discovered that Lindsey wasn't even involved in some of the HR investigations where Joseph's office has now blamed him for failing to report the misconduct. In the end, the State Board said the director should know that the buck stops with him. "Everyone who is about the business of education in Tennessee must recognize that safety and integrity are our number one concern," James said. Lindsey has denied NewsChannel 5's repeated requests for comment on these stories. MNPS is a large public urban school district of nearly 12,000 employees. Every employee, including the director of schools, has a role to play in ensuring appropriate procedures and reporting processes are completed and submitted to the state and other agencies in a timely manner. For many years, the process in this district has been that departments are charged with preparing any necessary documentation that requires the director’s signature for state reporting. Once that documentation is finalized, those departments are charged with picking up the final documentation and properly submitting them to the appropriate state agency. Again, this has been a long-standing practice. In recent weeks, after discovering a breakdown in this process, we have revised it to ensure we address all requirements in the law that went into effective in July. That process still includes having the responsible department and employee(s) completing the appropriate paperwork for the director’s signature, but now a consistent practice has been established and is being followed, in compliance with this particular state reporting change. The paperwork is now being submitted directly to the state board from the director’s office. Additionally, we are working closely with the state board and all of the cases identified as not being reported from the 2017-2018 school year have been properly submitted to meet all reporting standards. The statement did not respond to questions about why Joseph is blaming Lindsey for unreported cases in which he was not involved or even cases that occurred after Lindsey's departure.